With the kitchen acting as the hub of many family homes, small children often find themselves spending quite some time in there. However, most things in the kitchen are either too hot, too sharp or too just-been-cleaned for fascinated young children to explore. 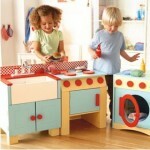 So, it’s unsurprising that toy kitchens are so popular. They’re perfect for encouraging children to play together, so that playing cooperatively and communicating are skills naturally practiced. The beautiful pastel shades are very pleasing to the eye on this compact kitchen, which manages to include all the essential elements needed to play chef. It keeps to a convenient size by placing features on both sides of the unit. On one side there is an oven, some shelves, a chalkboard and a sink. 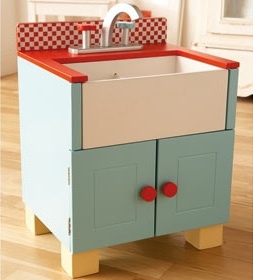 Thankfully the sink is plastic and removable, in case some real dishwashing becomes a spur of the moment bright idea. The other side of the unit has a two ring stove, dishwasher, fridge and microwave. The two ends of the kitchen also squeeze in some extra functionality: there’s a towel rail, phone and clock with moveable hands on one end; while the other end has space to leave a pot to stand for while, something lacking on many larger alternatives. Assembly is required and so is time and patience. It’s best to stick to hand tools as far as you possibly can, especially as some of the screws have a painted finish to co-ordinate with the kitchen where the screws are visible; taking extra care will help keep the paint at its best. Don’t let this put you off though, it’s worth the effort. The bold use of bright green and varying shades of pink decorating this kitchen make it stand apart from anything we’ve seen. 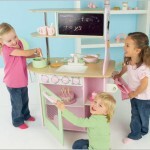 However, it offers more than a style statement, it is in fact the most complete play kitchen under investigation. Among the essential equipment there’s a large fridge/freezer, a four hob stove, oven, dishwasher with rack, sink and microwave. 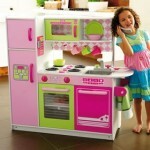 Also, there’s a telephone, towel rail and a 24 piece dinner and cutlery set. 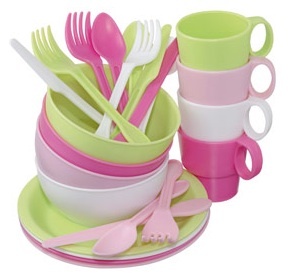 Most importantly of all there are hooks for hanging the cups and a little shelf space for storing the dishes, so there is no excuse for leaving dishes in the dishwasher or worse the sink. Assembly is required and time and care is thoroughly recommended. The colours may not be to every grown-up’s tastes but it does appeal greatly to girls. My Pretty Kitchen, because of it’s completeness, is The Toy Detectives Most Wanted. 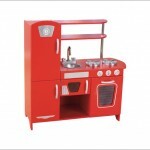 I’m very much taken by retro styling in my real kitchen, so my personnal favourite based on looks is the Red Retro Kitchen by ELC. Built into this product is a fridge-freezer, sink, oven, hob and even a microwave as a little nod to the extra convenience of our modern age. This kitchen has the most storage space which helps to add a little extra to play when things can be tidily organised, just how any kitchen should. Again, assembly is required and it it’s worth setting aside a couple of hours to build it. However, with all it’s parts and details this toy is not too difficult to assemble. The all-in-one style of the previous play kitchens reflect the popularity of fitted kitchens, which seems near universal these days. 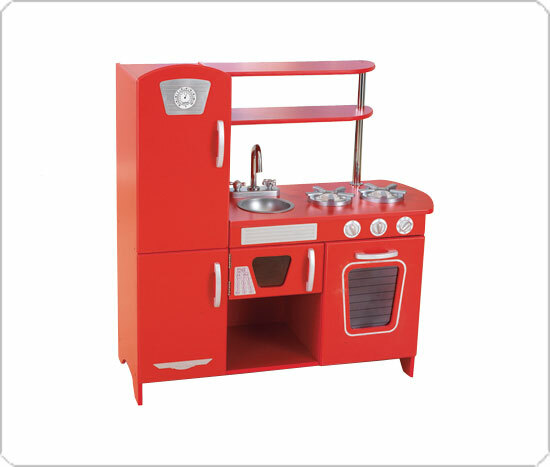 However, a different approach does exist, the Country Kitchen Set takes the form of separate kitchen units. 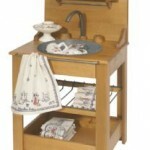 Each unit can be bought separately for £65.00 a piece but you can save £35.00 by buying all three together at £160.00. Moulin Roty produce a stunning range of traditional wooden toys. Rather than being painted, the beech wood used to make these toys, is simply varnished. The hob plates on the stove are made from metal, the oven door is see-through with a metal wire shelf inside and the knobs on the front can be turned. 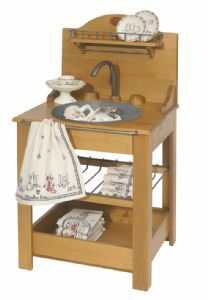 The sink is most attractive with a metal tap and enamel bowl. I could nearly enjoy washing at a sink as beautiful as this. 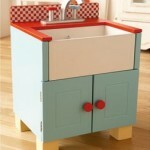 The sink and stove are both very sturdy and with no paint to chip the toys will age well. These are likely to see another generation of children who will just as easily fall for its unique old-world charm. Assembly is required and I recommend using a powered screwdriver if possible as this item is made from solid beech. 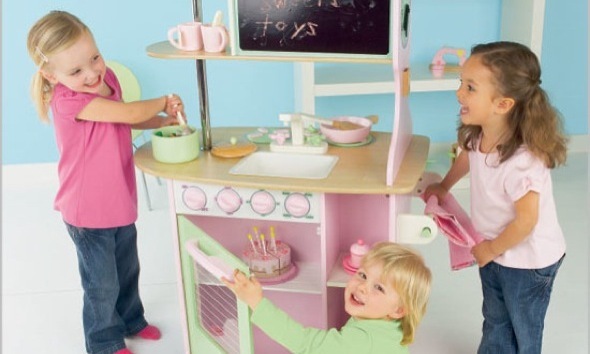 One potential downside with play kitchens is that with all this vegetable preparation and dishwashing being so diligently done at such a tender age, I suspect interest in such exertions may vanish when old enough to benefit the whole household.